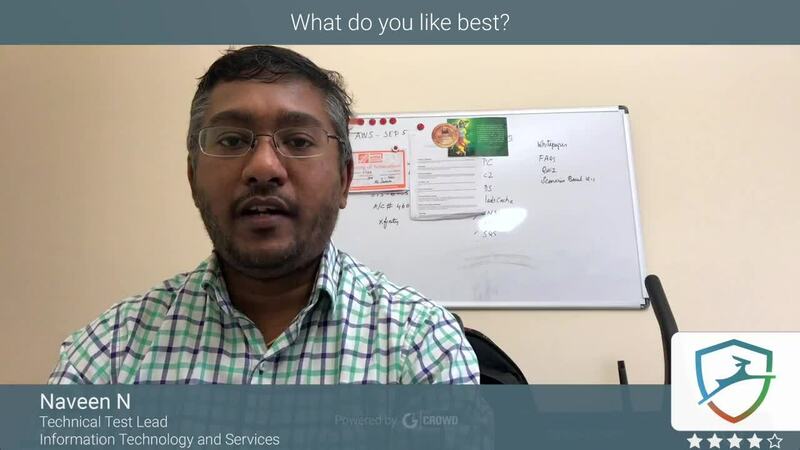 "Great productivity tool with security features ON"
"Changes the game for password management"
You cannot beat the secure password sharing with individuals and groups, and the ability to grant privileges. The auto-fill functionality is accurate 99% of the time. But on a few websites I visit, it struggles -- this could be due to scripting on the site and the way it's set up though. Also, would be nice to be able to store passwords for non-www based systems. Dashlane won't let you store a password unless there's a legitimate website address associated with it. Use the free version and see for yourself how great this app is. Password management. We had passwords to dozens of websites scattered all around. Dashlane has allowed us to *securely* centralize these, and has relieved the burden of remembering complex passwords. I love the fact that I can access both my personal passwords and my business passwords through the same account. Sharing passwords is a breeze. Obviously the folks at Dashlane have put a lot of effort into user testing / UX -- it's just a pleasure to use. "Peace of Mind in an Insecure Online World"
Dashlane has brought sanity to my business workflow. Never again do I have to "remember" a quick password or login information that I create for client sites. Dashlane not only creates an incredibly secure (and un-rememberable) password but also stores it for me with a click of a button. Then when I'm ready to bring the client into the setup, Dashlane makes it a breeze for me to share that password and login information to the client without my need of surrendering the security of the password. I really wish there were a better Chromebook solution but for now the Android app on chromebook and the web-based access work. Dashlane has been doing one thing and one thing extremely well. They are making security easier to everyone on the internet. One of the struggles I've encountered in business is falling into the trap of thinking I have a super secure password that I've memorized and then use it on all the sites that need a quick password. Dashlane not only eliminates that "crutch" but has a useful "Dashboard" that tells me how my security score is doing, how many sites share the same password, how many passwords are bad passwords, and even alerts me to when a site (like Target or Yahoo) gets hacked and reminds me to change the password. Dashlane Business has solved the problem of being a guiding light of trying to help me get better and more secure with my online presence. 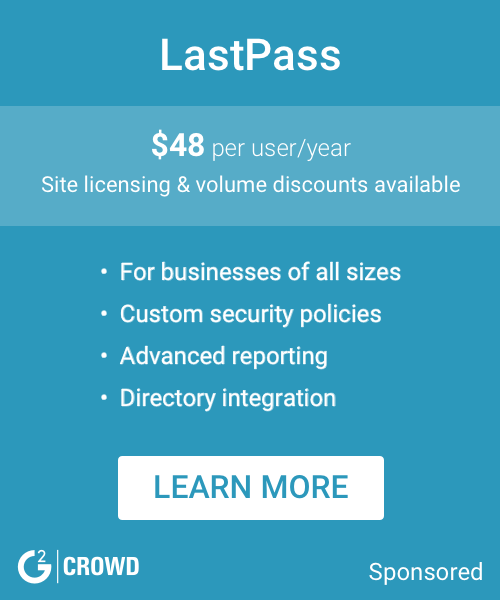 "Go-to solution for your password management"
I especially like the integration between Dashlane and the browser (Chrome), both on desktop and on mobile. Centralizing all my password makes my life much easier. The interface is very clean and usable, the password generator and the auditing tool also work well. Integration with Firefox causes crashes (apparently not due to Dashlane, but still an issue). On Windows, you might experience occasional hiccups. It seems that the desktop application consumes quite a lot of resources. Sometimes, you need to refresh the page in order to trigger the wizard. Not sure why this happens. Speed of the dashboard might be better, though. Some way of batch editing accounts would be a plus, but I understand this might undermine the security. There are several solutions available, but we think Dashlane is one of the most usable. I don't need to remember my passwords anymore. I think a password manager is an absolut must-have for any businessman. "Best password management for anyone"
Clean interface, works with all browsers, great phone application. Great organization of passwords and secure notes. 2-step authentication generator in the app. Easy sharing. Easy password changing on many sites if there is a breach at some large company. Sometimes the browser extension can be slow at loading the password. With any small business, you have passwords for services all over the place. Keeping them secure in one place and having unique passwords is important if your information needs to be kept secure. Dashlane has made that as seamless as possible. "Great Password Manager for Mac User"
Dashlane is a wonderful software that I can use to manage all of my different passwords and have access to them on my Mac and iPhone. Never again will I need to go through the process of changing a password that I have forgotten...because with Dashlane, I've got all my passwords in one area. The only downfall is the cost of the premium Dashlane subscription. I'm not a fan of subscriptions....I would be way more apt to purchase an app at a premium than to pay a monthly or yearly subscription fee. If you are looking for a software to help manage your passwords, Dashlane could be the one. Give it a shot and see if it can help you like it helped me! Being able to keep track of all my passwords has been a huge benefit. I group them by personal and work to help me organize them even better. "Great interface & friendly pricing "
Dashlane goes a long way in securing your passwords and managing them simply. It’s eash to use and has many support features in addition to both mobile and desktop applications. You can login just about anywhere if needed and sync the passwords accordingly so that passwords, usernames and secure notes can be accessed from multiple devices. Every so often dash lane changes my usernames to “null”, other times it doesn’t update or sync correctly after I change a password. Dashlane is beneficial for those who typically utilize several passwords. Makes tracking, updating and logging in to programs and sites quick and efficient. The plugins are built well and easily added to all major browsers. The Software itself is excellent and offers great sharing options as well as Two Factor Authentication. It can be organized to your heart's content and works seamlessly across all devices. This software has literally changed my life! It can be glitchy for a while when web pages make changes to how you enter passwords on their sites. They are pretty good at keeping up with updates but sometimes even after notifying Dashlane about a problem with a login, it can be a bit before they are able to get it remedied. Pop up forms can be a little problematic as well at times but they are improving compatibility all the time. Be careful when sharing passwords with others to set the correct permissions. Other than that, just enjoy not having to remember ten million passwords any longer! Running an ecommerce business with many other users creates a mess of logins that all need to be shared and organized. This allows for multiple levels of sharing and access to each other's logins without needing to share the actual password itself. As the managing partner of a law firm, security for our clients' files is a top priority. Dashlane gives us the security we need, especially with the alerts to change our passwords when there is a breach, the passwords are too easy, or the same passwords are being used over and over again. I love the feature allowing users to share use of passwords without disclosing the actual password. The secure payment option and saving receipts is a big timesaver as well. As a person with a master's degree in Technology and having worked as a programmer, I have been know to find the bugs in software -- basically, if it can be broken, I tend to break it. I have never broken Dashlane. Nothing. It's amazing and reliable. The amount of time I save using Dashlane means a lot more billable hours. Protecting confidential client files and managing employee passwords over several devices and software applications. Dashlane does it all for me! "Love it! Easy to use, beautiful interface!" Dashlane offers a beautifully designed interface that is user friendly while offering important feature like the automatic login of all your accounts, the security dashboard that alerts you in real-time if a security breach is recorded and the emergency contact feature allowing you to set a contact for your most important accounts. The free edition is perfect for any standalone users but if you wish to synch it to your phone it can be quite expensive. It could improve the response time of their email support. It is easy to use for everyone and easy to manage when used in a team environment. "Dashlane is the best Password Manager for me, and I've tried most of them"
The Dashlane user interface is better than any other password manager's user interface, as far as I can tell. I have tried the two major competitors recently, giving them a few days trial (I have used each in the past as my main password manager--I was just trying them again to make sure I was being fair) and after each, I yearned to come back to Dashlane. Dashlane is easier to use, gets in the way far less often, and just "does what I want" more times than not. I can honestly say that I have tried them all, and have come back to Dashlane several times. The Secure Notes feature in Dashlane is simply not as fully fleshed-out as in some of its competitors. I have requested a feature update on this in the past. I still use a competitor as my storage for all my software passwords, because Dashlane just doesn't do this as well. On the other hand, it does many other things far better than its competitors. I save massive time and effort both in my own computer use, not having to remember any passwords, and having a unique password for most sites. In addition, my support time is minimized, as even beginners can figure out how to make good use of Dashlane's interface. So I save time and money on both accounts. "LOVE IT! ... But There Are Some Minor Annoyances"
I love that I can easily store passwords, and other sensitive data in Dashlane. It's also WONDERFUL that it auto-fills in forms. Such a time saver! You used to not be able to use Ctrl + arrow or Ctrl + Shift + Arrow to navigate in the search field of the desktop application, but it appears that you can now. I LOVE IT! When I have the Dashlane app open on my computer if the cursor is in the search field and I have typed something, I can't use the "home" and "end buttons" to navigate. That can be annoying. Also, it does seem to have issues with some websites, but I think that is more a function of the website itself not the application. I would definitely recommend Dashlane business. I love it. If my company didn't buy it for me, I would pay for it with my own money. I save a lot of time with Dashlane when I have to fill out online forms at work, or make credit card payments. Really the biggest thing is saving so much time. I appreciate how safe this product is. They don't store your master password so if you forget your master password you must reset your whole account. Although this may be frustrating to some it is a very safe approach and for that I am grateful. I forgot my master password and had to do an account reset and while it seemed daunting it was actually very simple. I don't like how confusing the platform is when you log on for the first time. It is difficult to distinguish where to go and what to do as a new user. A tutorial would be helpful or even just a more simple design approach. I still don't feel like I have understood all of it's functionality completely but I'm hoping that will come with time or tutorial blog posts somewhere out there. Take your time to get to know Dashlane and all of it's features because there is more to it than a password keeper. You will reap many more benefits by tuning into all of it's features. I no longer waste time guessing what my password is or resetting passwords. It has kept me more organized and it is also a safe place to store notes rather than on your phone's notes app. Our company as a whole has felt more organized and more protected. "A great password manager and more!" 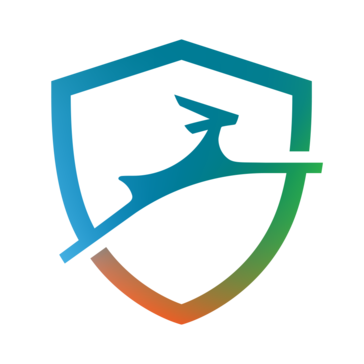 What I like most about Dashlane is that they are a true life-saver for password security, keeping your information safer than ever and easy to use. At this time, I must say, that I can't think of anything I don't like per say, but I wish Dashlane had the ability for you to edit their auto generated passwords, to make them more personal and easier to remember, if need be. I suggest reviewing Dashlane's information, get all the facts, and then you can make an educated decision as to whether or not you feel they are a good fit for your business needs. I'm solving the ability to store and use all of my passwords and more in one secure place. "Useful but a little bit spammy at times"
Both me and my team have easy access to all passwords relevant for our jobs. You get a lot of pop-ups while on the browser asking you to save information and passwords that don't really make sense. Even after dismissing the pop-up, it keeps appearing at later instances. Unsafe password sharing through chat channels. "Dashlane is so easy to use"
Dashlane is so easy to use. That's definitely my favorite part. I used to have the same passwords for all of my accounts, but with Dashlane I have unique, complex passwords for each account. It's hard to imagine going back to life without Dashlane. Not much to dislike. Does what I want it to do. Keeps all of my accounts safe, whether they are personal or for business! Dashlane makes it easy to use either. "Makes Password Management a Breeze"
When I'm doing contract work for teams and businesses, nothing makes it easier than having secure password-sharing among these groups. I really don't know how I did without it. Perhaps my needs are different, but I have not had the problems others have mentioned. So far, I don't have any dislikes. For my contract work, I honestly believe this keeps us all working together with ease and while being secure. Those who do website management or are on teams that have different websites, all of which have different passwords, will likely benefit from having these securely in a centralized location. Super-secure passwords really aren't, for the most part, all that secure. This also tells us on the team how well we're doing with being secure. I love that the software syncs across all my devices. It is extremely helpful to have Dashlane auto save passwords on new sites, as well as recommend complex passwords you would be deterred from using normally. I dislike that right now there is no auto generate password function without having it do so directly in the password box of a website. As opposed to the program having a password generator I can use for anything. Great solution to have with multiple people in the office sharing logins etc... you can easily add or remove users access to anything. "Dashlane - Pretty Darn Good"
Secure storage for passwords, ability to update items as needed. Auto-fill extension for Chrome can sometimes be buggy if you have multiple accounts under the same website (example: AWS). Secure storage of passwords, as well as creating complex passwords through the generator to comply with company password policies. "This tool really makes a difference "
Being able to manage your passwords across devices. Using more secure password is safer for our business. Fill out forms correctly and super fast. Really there is nothing I dislike about dashlane. I guess if I have to have something it would be the security score because it reminds me I have to change things. Also some browsers / websites dont work it is rare but it happens. Password changes, stronger passwords, this is a great user audit tool. "Great way to keep passwords organized "
Sometimes the browser integration is wonky. Occasionally a field that would not hold any login info is defaulted for Dashlane to ask about saving a password. Minor annoyance. We were creating so many unique login combinations for multiple sites across multiple users - Dashlane simplified that. "Never have to remember another password!" The best thing About Dashlane for Business is that it keeps all of my daily logins secure. Because Dashlane has to work for so many kinds of sites and interfaces, the experience isn’t always smooth or consistent. "Secure Password Manager for the Business!" Some websites/apps are incompatible or do not respond well to multiple login credentials. Also mixes up credentials at times, which can lead to frustration. Sharing login credentials for managing different aspects of business. It safely stores all passwords. It will auto fill in some passwords for your. Also it generates secure passwords. Sometimes it does not automatically fill in the log in information for sites. "Time Saver with a + Factor"
The Chrome browser extension has crashed repeatedly. Unique passwords for every site. Also easily to share sensitive passwords temporarily with contractors. The increased security without increased hassel is priceless. Sometimes firewall will interfere with how Dashlane responds in a browser. That can be frustrating. I strongly recommend it, though I have not tried other vendors products so I can't compare with anything. Helping users have better passwords that they would be reluctant or incapable of doing without writing them down or reusing them. "Great time saver for the multitudes of passwords"
I like being able to generate passwords that are nearly hack-proof and not have to remember them. I only wish that when the passwords were saved instead of just adding another entry. I am not a Dashlane Business user. I use the personal version. It looks like I have duplicates throughout my passwords list. It would also be nice if there were a "date added" so I could tell which one was the newest. Sync should be free otherwise very little use and advantage. As a digital marketer myself I have more than usual accounts so I need a password manager that saves all my password and Dashlane is Awesome for this. "Works well with managing tons of passwords"
Similar to the iCloud Keychain, Dashlane makes encrypting passwords easily accessible to the end user. For those looking to protect confidential information without sacrificing accessibility, I highly recommend. The set up was a bit arduous at times, making it difficult to operate. Nothing. The product meets all my requirements. secure information. The problems with always having to keep track of all passwords and secure info. "This is a lifesaver. " sometimes it fills up forms incorrectly. Moreover, sometimes the pop-ups become annoying. "Never Have to Remember my Passwords"
Makes it very easy to store all your passwords in one place. I am cautious about saving all my passwords in one place. Make sure you are confident holding all of your passwords in one place. Forgetting passwords, and having to contact tech support to resolve issue. Saves time. Dashlane is the most efficient, secure way to manage passwords. Synching across devices makes life easy. I can't think of a single thing I don't like. Time efficiency is crucial for me. I don't like having to sort through saved passwords that aren't synched up across devices, and Dashlane solves that problem. Easily keep track and share all your passwords. The Dashlane icon that shows up on forms across the web can be a bit annoying. Love this product. Makes logging in, storing and creating passwords very simple and easy, as well as safe. Not much to dislike. Cannot think of anything. * We monitor all Dashlane Business reviews to prevent fraudulent reviews and keep review quality high. We do not post reviews by company employees or direct competitors. Validated reviews require the user to submit a screenshot of the product containing their user ID, in order to verify a user is an actual user of the product. Hi there! Are you looking to implement a solution like Dashlane?